Requirements to articles | Економічний вісник НТУУ "КПІ"
Articles in Ukrainian, Russian and English will be accepted. 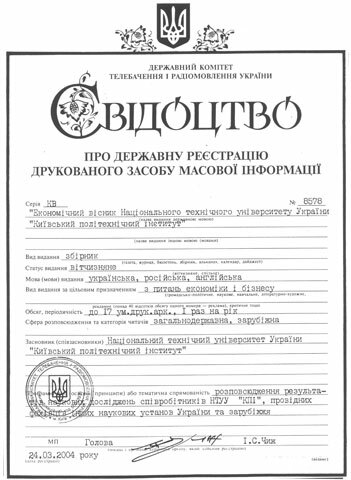 Articles should meet the requirements of HAC of Ukraine (http://www.vak.org.ua), contain elements of scientific newness. There should be accurate references to the working out made by author, as well as to partial and complete adoptions used in the article. Article size should not be less than 0,25 printed sheets (10 thousand of printed characters) and not exceed 0,5 printed sheets. Requirements to the article design are listed in appendix. All indicated subpoints should be included in the article and be set off in bold type. Articles move in printing (with CD) or send to the e-mail: fmm@kpi.ua or o.zozulyov@kpi.ua. Articles should be presented in printed version and on a CD. Articles should be typed in Microsoft Word. Filename can have a *.doc or *.rtf extension. Type of the article text – Times New Roman Cyr 14. Tables should be made by 12 type. There should be mirror borders; upper and inside – 2,5 sm, external – 1,8 sm, bottom – 3,5 sm. Line spacing – 1,1. Diagrams and other graphic data are given with an appropriate associating. Printed version of an article can be signed by author at the last page. Structure: UDC, the author (authors), scientific degree, an academic status, a work place, article name, the summary, keywords, introduction (problem statement, its communication with last researches and publications, scientific and practical problems, a substantiation of an urgency of research), problem statement (the generated research objectives), methodology (the short list and a substantiation of methodological base of the research, the used methods, mathematical apparatus, algorithms and the software), the basic results of research, conclusions (scientific novelty, theoretical and practical values of results of research, prospect of the further scientific workings out in the given direction, the recommendation concerning use). Site of scientific bulletin: www.economy.kpi.ua. Articles with non-compliance with the requirements or presented after deadline will not be published. Articles will be reviewed by the editorial board of scientific bulletin.